12 Monkeys | It's Bloggin Evil! With “The Walking Dead’s” season 5 right around the corner come in October, this review of Syfy’s first episode “Z-Nation” seems fitting as we head into the best month of the year, but Z-Nation isn’t just a Walking Dead imitating hack even if the intentions might have been meant as so. The first episode entitled innocently enough as “Puppies and Kittens” starts as engaging enough with zombies ripping the U.S. nation apart limb by limb and we’re already in year two with the preface setting up the series’ main plot. After the main credits roll, year three begins our travels. The country is overrun, the plague is vast, and the zombies are fast – two good pieces of evidence that separate Z-Nation from The Walking Dead, no slow moments of build up and no slow moving dead heads. Something else that Z-Nation possess that doesn’t make it feel like AMC’s cash cow is the ridiculous scenarios the survivors put themselves in and how they react to those life and death choices. I’m talking about trying to eliminate a zombie baby because one of the character’s bleeding heart for children couldn’t be handled. Do these situations of inane instances ruin Z-Nation before even getting started? In short, no. Reason? Z-Nation is the baby of The Asylum, a low budget film studio that thrives on the coattails of hit horror and sci-fi features creating “Mockbusters” and able to get away with it. Some recent hits from The Asylum have been “Android Cop” (“RoboCop”), “Abraham Lincoln vs. Zombies” (“Abraham Lincoln: Vampire Hunter”), and “Transmorphers: Fall of Man” (“Transformers: Revenge of the Fallen”). Get it? In my humble opinion, I know Z-Nation will be successful hit for the Syfy channel who as of late have produced some really good shows like Helix and whom have a made for TV adapted series of 12 Monkeys just around the bend. 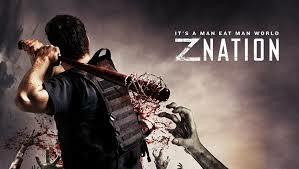 Z-Nation went viral on the internet with 300,000 piracy visits just after it’s premier release on Friday. Piracy shouldn’t afflict Z-Nation into cannibalizing itself because, hey, The Asylum lives and breaths of recreating blockbuster films into low-budgeted, Danny DeVito twin-like copies that do just as well on TV as they do on the internet. Go figure. The series stars Thomas Everett Scott, DJ Qualls, Pisay Pao, Anatasia Baranova, and Michael Welch. Catch it on Syfy on Friday nights.